My final assignment of the Garden Design Course and I’m left hanging for more! I’ve thoroughly enjoyed learning about garden design and feel I’ve only touched on it ever so slightly. I might at a later stage invest in doing a longer, more thorough course in garden design. Not because I want to become a garden designer, far from it – dabbling around in my own garden is enough for me – but because I’ve loved every minute of it. In this final week of the Planting Design course I’ve been doing through My Garden School, the forth and final chapter is entiled “Seasonal Colour & Excitement”. We are introduced to the work of Dutch garden designer, Piet Oudolf. Oh my … that opened up a whole new world for me! If you haven’t yet spent any time looking at his work, I strongly recommend that you do. I spent a few happy hours looking at his gardens (all online of course – ah the joys of the Internet!) and I’m now a huge fan! I’ve spent a lot of time reading about his work and found this statement he made in a post on Gardeninggonewild.com which gave me food for thought … “He feels that most clients still want immediate results with gardens: that they are lacking in patience and are not willing to observe and enjoy the beauty of a garden maturing over time. For Piet, the public may offer positive comments about his work but they are still reticent about fully embracing it”. (Reference here). This is something I need to practise – patience! I want my garden to “hurry up and mature”. This was a reminder to me to just enjoy it and not be in such a hurry. 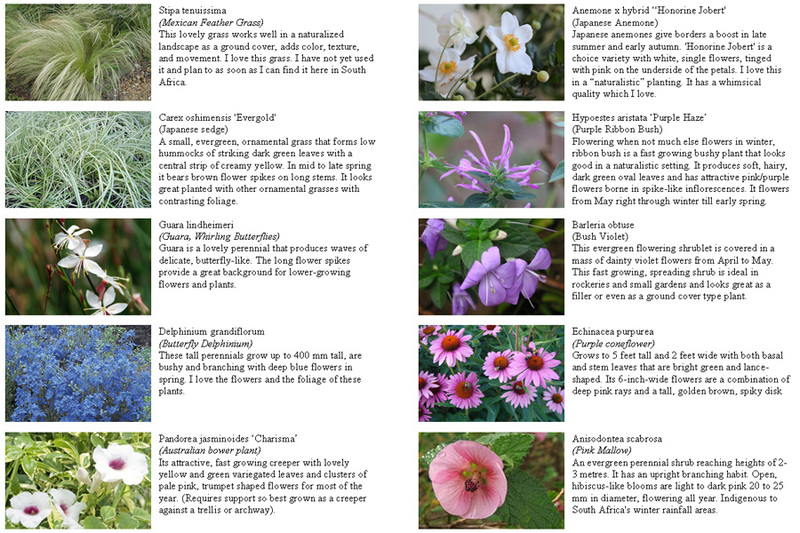 So this weeks assignment was: “You are planning a small ‘naturalistic’ planting scheme. Use the work of the Dutch designer Piet Oudolf as a source of inspiration for your design”. 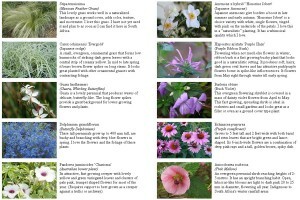 We were given certain guidelines of plants to choose (hedges, bulbs, grasses etc). and had to list them all with pictures once again. The screen captures show part of my final assignment. I really enjoyed doing this. It took absolutely hours to decide on my choices. I based it on my whole back garden with just the trees in situ and nothing else and planned it on the basis of it having half sun and half part shade. I am almost tempted to rip everything up and start all over again!. Just kidding of course, but I might incorporate some of what I came up with in the future and the area that was destroyed two weeks ago because of the new french drain will be getting a make-0ver with some of these choices. “Experience starts the moment you start to like gardening. You can’t do it right the first time. You can’t even do it right in a few years. You always see the next step you have to do. Start simply, putting good combinations of plants together, and work from there. You have to go through all the steps. You cannot skip any lessons. That is honest. It’s hard work. But you get something back, that’s the good thing. It’s like raising children. You try to do your best“. Thanks for introducing me to Piet Oudolf’s work. It is amazing. I like how he compared gardening to raising children! Peters sense of scale is amazing. A great example of using all landscape design elements and principles. Wouldn’t that be cool to be able to work at that scale and wait for results, season by season. That is why garden design is so rewarding and different from other design formats. nice. I love the last quote you shared – I may have to copy it down in my garden journal. Wow, I’ve never heard of Oudolf or seen anything like this kind of planting. I agree with the others – it is large scale, but the strip of plants by the three arches could be replicated in the border of a back garden. Thanks for perkng up my imagination today ! Hi Christine, What a fun assignment! It makes me think that I should take some courses as well. 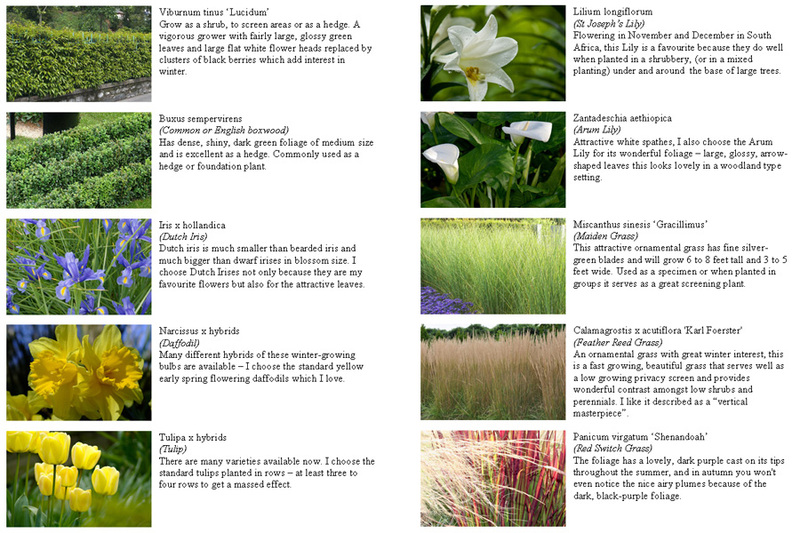 I am a fan of Piet Oudolf. I think there is lots to learn from his garden design. Have a great weekend! I really enjoyed the slide show. His gardens have a very natural quality which is soothing and comfortable. Hi Christine, I have really enjoyed your gardening design series of posts! I’ve read through them and re-learned and re-membered alot about design principles! I started my third “big” garden three years ago so things are starting to mature and I have maintained some self control not buying one of “everything!” This has helped create a more uniform look but I still have a long way to go as far as design principles go, especially scale. That is the hardest part for me…figuring out how much space things need as they mature. Anyway, I love many of your choices for the final assignment. 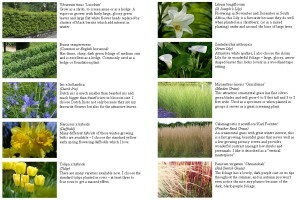 I grow 4 of the 6 grasses and several of the other choices as well. I was not familiar with Mr. Oudolf, until I read this post. I love his photos and will look for more. It reminds me a bit of Christopher Lloyd’s work – he has always been my inspiration! He was awesome and I had the chance to go to one of his lectures a few years before he passed. A sweet, wonderful, entertaining gent… Thanks so much for all your posts! I wholeheartedly agree. You can’t learn anything without making mistakes and learning from them–you in fact can’t do it right the first time. It’s a process not a product. I enjoyed looking at Oudolf’s work but would love to see him design gardens for smaller properties in the shade. Not in his repertoire apparently. I love his work. His type of design would actually work very well here, and I considered something like that for a while. In the end, though, I personally wanted something different. I think he has had a giant impact on modern gardening, and I see his influence in a lot of plantings. Good luck on your assignment.